Small ants that moves fast are difficult to photograph. Organ Pipe National Monument, Arizona. October 20135. These slender ants nest in hollow twigs or stems. The galleries were often originally hollowed out by beetles or other insects. 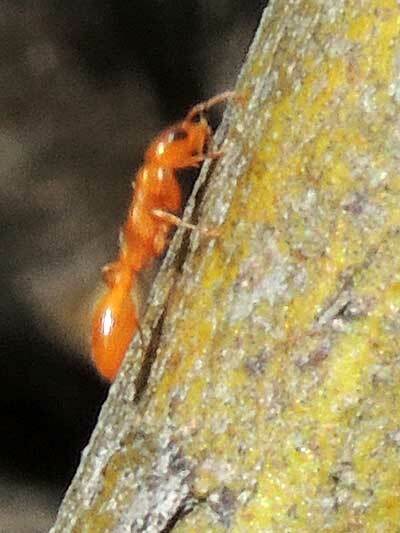 Pseudomyrmex are highly predatory and so the host plant probably benefits by having herbivores removed or excluded. Colonies of Pseudomyrmex are small, often less than a few dozen individuals. Their eyesite is acute and they respond to anything that appears to be targeting them. Copyright Michael J. Plagens, page created 7 Feb. 2016.